Finally ePSXe for Android is back on Google Play. Thank you so much for your support. Yesterday we received a notification from Google about the removal of ePSXe from Google Play because of malicious behavior policy violation. After reviewing the policy we believe this is an error and are trying to work with them to resolve this issue. Please stay tuned, we will inform you as soon as we get an update. In any case, we want to thank all users for their support, ePSXe would not be possible without you. ePSXe 2.0.5 for Linux/MacOSX have been released. - In linux version fixed some problems with gamepad configuration. ePSXe 2.0.2 for MacOSX have been released. You can find it in the downloads section (how to install below). 2) Double click in the download folder to uncompress. 6) To run a iso, uncompress your iso, then choose in your iso "open with" and select ePSXe202, or drag and drop your game in ePSXe202. 7) To run a cdrom, config your cdrom path in $HOME/.epsxe/epsxerc and double click in ePSXe202. 8) For other options, you have to run from a terminal and use command lines. Epsxe for MacOSX is a port from the Linux version and the UI is based on GTK+3. Due to MacOSX dependencies system you will need to get the GTK+3 libraries used when it was compiled. So it is recommended to use HomeBrew to install. 3) Now you can run epsxe from a terminal. ePSXe 2.0.2 for Linux have been released. Updated to 2.0.2 core, including a 32bit version, and a 64bit version (alpha). Updated the UI to gtk3. ePSXe 2.0.2-1 for windows have been released. If the version 2.0.2 is crashing after run bios/game, or you are using the Russian language, please update, in other cases it is not necesary. It fixes a bug reading the cpu overclock data from the register, and the config gpu in Russian language. ePSXe 2.0.2 for windows have been released. ePSXe 2.0 for windows have been released. - First of all, ePSXe 2.0 now requires Windows Vista or superior. While it could work on Windows XP SP3, it has not been tested. - Multi-language support. Currently there is support for English, Spanish, Japanese (thanks to Nekokabu) and Italian (thanks to Domus). - Added a gamelist window. Now you can open a gamelist window by selecting File->Open Gamelist or clicking on the letters "PSX" from the ePSXe logo. - Improved CPU/overall timing accuracy. - Improved GTE accuracy. and added support for widescreen and subpixel precision (GTE Accuracy hack thank to Edgbla). - Included the Pete Opengl2 GPU core with support for sub-pixel precission (gte accuracy hack) and memory detection. Millions of thanks to Pete Bernert, Tapcio and Edgbla. - Teamviewer incompatibility is resolved with the internal GPU plugins. - Added a configuration window to select options for the internal SPU Plugin. - Fixed support for CDDA music in external SPU plugins. - Improved the internal input plugin. Improved multitap andd added autofire support. - Added support for Konami Justifier gun using the mouse. - External Input plugins support. - Added game profile by game. - Improved cheat support. Fixed cheatcodes gameshark conditional, added increment/decrement types (0x10-11, 0x20-21) and copy type (0xc2). - Improved HLE bios emulation. 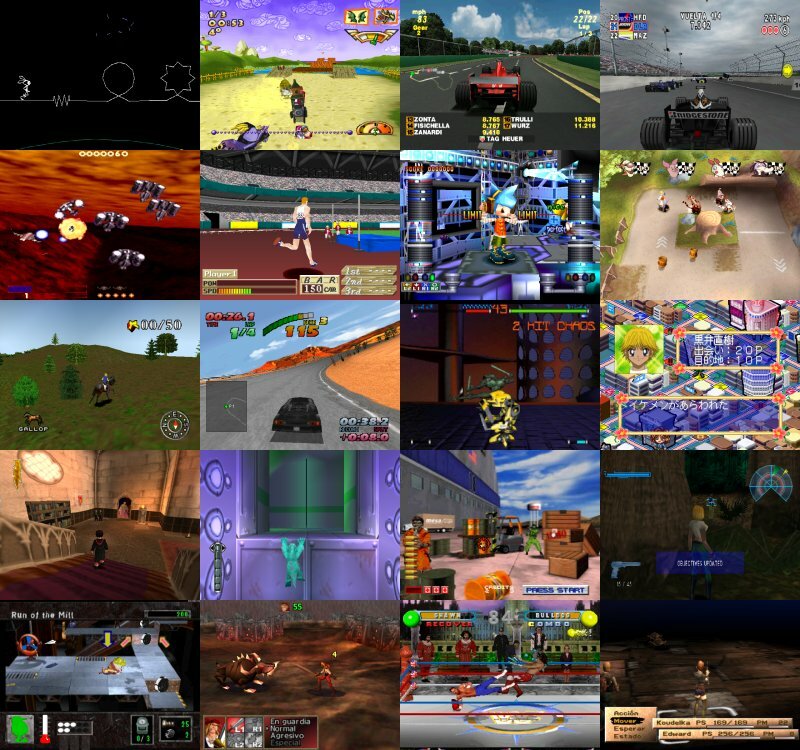 Starting with version 1.9.25, the HLE bios has been improved to support more games: Wild Arms, Jet Moto, Toca World Touring, Simcity 2000. Memcards support was improved for a lot of games such as Dinocrisis 2, Metal Gear Solid, V-Rally2, Diablo, Ridge Racer Type 4, Driver, Echo Night and Azure Dreamns. ePSXe 1.9.25 for windows and linux have been released. You can find them in the downloads section. - Added HLE bios support (an official PS1 is recommend yet). From this version ePSXe can run games without an official PS1 bios. Compatibility is lower and memcards support limited. VERY IMPORTANT: Savestates done with a official PS1 bios are NOT compatible with savestates done with ePSXe HLE bios (Besides it uses a different namespace). - Fixed multi-bin format in Windows version (redump format). Now it supports the games saved in multiple bins files + cue file directly. - Better SBI subchannel support (for example in Medievil) and fixed SBI in games with ECM format. Added SBI support in MDS/MDF format. ePSXe 1.9.0 for windows and linux have been released. As promised ePSXe 1.8.0 for windows has been released. We hope you will enjoy this release! We would like to give our thanks to Gladiator, from www.psxdatacenter.com, for the thousands of tests he has done in the last 4 years. Without his help creating a version with high compatibility would have been almost impossible. Many thanks to you and your brother :). We would also want to give our thanks to Shalma who worked on ePSXe Shark, several plugins and plugins "repairs series". He did a wonderful job, some would even consider it "magic", finding then fixing numerous bugs and deserves our most sincere thanks and admiration. ePSXe 1.7.0 has been released. You can download it in the files section. It has been long time since the previous ePSXe status update. During this time the ePSXe development has been on hold and our lives have changed a lot, probably just like yours. In summer 2007 we decided to continue working in ePSXe encouraged by the users support even after 4 years without updates. ePSXe is currently in final testing and we hope to release a new version very soon. We wanted to thank you for your support and show you some screenshots from games that should work better in the next release. ePSXe 1.6.0 has been released. Many things have been fixed and some more features should be included in another fix version that will be released shortly. As usual you can download the latest version in the files section. ePSXe 1.5.2 has been released. Many things have been fixed, you can download it in the files section. P.S. : We have fixed the donate page. Today ePSXe is 2 years old so we have decided to make a new release in the next few days. After a long down time the page is finally back online. Development of ePSXe has slowed down during the summer but is now back to speed. We would have liked to release a new version today but it isn't ready yet. You should expect a release of the new version in the following months when the new features are fully implemented.